It is 5:59 a.m. and you are lying in bed, peacefully oblivious to the world. The sudden trill of your alarm clock wakens you. You smile softly as you hear the pleasant chirping of birds outside your window, indicating the start of a sunny day. You strain to listen for sounds coming from the other bedrooms. Are your children awake yet? Is the baby crying? You hear a faint rustling and then a sweet voice, “Mommy, can I have breakfast?” You have only been awake for about one minute, but you have already used the sense of hearing several times. This is one of the gifts from Hakadosh Baruch Hu that we often forget to stop and appreciate. Reb Binyomin Silverman*, a yungerman learning in kollel, has learned not to take this gift for granted. “Baruch Hashem, I am here to communicate with you. I try to appreciate the chessed of Hashem of being able to hear,” Reb Binyomin asserts. Until around age 30, Reb Binyomin, who is sufficiently musically blessed to lein and get asked to serve as a shliach tzibbur, heard “normally.” But there was a change slowly taking place that no one — family members, Rebbeim, friends — picked up on. Reb Binyomin was gradually losing his hearing. This was playing out in all areas of life, but, primarily because of the subtlety of its progression, neither he nor they had realized. The experience of having been able to hear normally, losing that ability and then regaining it had a profound impact on Reb Binyomin. “I feel that I am in a unique position to appreciate the gift of hearing and understand and discuss hearing and hearing loss,” Reb Binyomin stated. “My experience of slowly losing my hearing and then having it restored was absolutely amazing. I have had subsequent minor loss which I compensate for with a hearing aid, which is also an experience that deepens my understanding and appreciation of the gift of hearing. While the cause of otosclerosis is unclear, Reb Binyomin is passionate about encouraging others to do whatever they can to protect Hashem’s wonderful gift of hearing. This brings us to the topic of noise-induced hearing loss, or NIHL. The noise that causes one to lose one’s hearing can be a one-time exposure to an intense “impulse” sound, such as an explosion, or continuous exposure to loud sounds over an extended period of time, such as noise generated in a machine shop or in the subway. Noise is measured in decibels. According to information provided by Baltimore audiologist Mrs. Miriam Singal, a whisper is 30 decibels, the hum of a refrigerator is 40 decibels, a vacuum cleaner is 70 decibels, a lawnmower is 90 decibels, and a jackhammer is 130 decibels. There are various limits of exposure that have been established. The Occupational Safety and Health Administration (OSHA) recommends eight hours of exposure to 90 decibels daily, but only two hours of exposure to 100 decibels daily. NIOSH (National Institute of Occupational Safety and Health) recommends allowing the 8-hour exposure to less than 85 decibels, and only 15 minutes of daily exposure to 100 decibels. Often the damage done by continuous exposure to loud sounds is gradual; a person does not notice hearing loss until it reaches a certain threshold. In fact, loosely simplified by substituting decibels with percentage, it can be said that one can lose approximately 20-25 percent of one’s hearing and not even notice! After that, each incremental amount has the potential to make a significant difference to one’s functioning. NIHL, which affects the inner ear, is irreversible and cannot be corrected by surgery, though it can be treated with hearing aids. Some activities that put people at risk for NIHL are listening to music at high volume through earbuds or headphones, playing in a band or orchestra, attending loud concerts, being around loud noise for extended periods of time, or riding snowmobiles or motorcycles. What about the volume of music at chasunos? Many people complain that the music at chasunos is too loud; conversation is impossible and perhaps they even come home with ringing in their ears. But they wake up the next morning feeling better, so they assume no lasting harm has been done. Reb Binyomin asserts, “Through the research of my experience, during which I had access to high-level medical expertise and asked a lot of questions, I felt I had a rationale for why people make the assumptions they do after exposure to loud music, and could approach this topic in a most peaceful way, which could be helpful. “The guiding principles here are the combination of a few ideas. “Hashem starts most of us off with so many rich components of hearing.” We are hearing so many more sounds at a given time than we usually realize. They’re always made available by our ears and processed by our brains, but not necessarily accessed consciously, though we naturally do toggle them rapidly. “Since we’re only concentrating on a limited amount of what we’re even aware is in our environment, it’s easy not to notice a missing dimension. “We know that a person can function with close to a 25 percent hearing loss. That means that, before then, it is completely plausible for a person to sustain a loss and have absolutely no idea. It may require an audiogram to pick up on it, after which that person can become aware that a particular normal sound is now out of range. “So, say someone goes to a chasunah and experiences ringing, or a hushed ‘on an airplane’ sensation in the ears. Say that, by the next morning, the sensation is gone. What should he or she think? It would be counterintuitive to think there’s a problem. Indeed, today more young people are experiencing some degree of hearing loss. Surveys show that 24 percent of adults in the United States ages 20 to 69 have features of their hearing tests that suggest noise induced hearing loss. According to a 2017 study, 19 percent of people between the ages of 20 and 29 have some hearing loss. “Music at a chasunah is meant to enhance the simchah, yet controlling the noise level at a chasunah has become an emotional and sensitive topic. This is largely a reflection of the fact that people don’t realize the effect it has on them. Some people enjoy the loud music and feel that it uplifts the mood at the simchah and contributes to their ability to be mesame’ach chassan v’kallah. But the question is if it’s really a good idea to have it so loud. “It may be worth noting that if one feels that the music is not at all loud, or if one finds oneself turning the car stereo or other audio device volume up, to make sure their hearing is still at 100 percent. Is it possible to find the proper balance, wherein the music promotes the proper atmosphere of simchah, yet the guests are not overtaken by the music and are able to carry on conversations? Mr. Nossi Gross of Zemer Orchestra in Baltimore says that he is often able to keep his average decibel levels in the mid- to upper-90s in front of the band, and in the low to mid 90s on the dance floor. As noted, according to the OSHA, one can listen to 100 decibels for two hours a day without detrimental effect. The total time of dancing at a chasunah is less than that. Mr. Gross explains that the volume on the dance floor needs to be louder than what reaches the tables, and suggests that the hall be arranged in such a manner that the dancing takes place closest to the band. This way, those who are sitting during the dancing do not have to be exposed to such a loud volume. Some people have begun to bring earplugs to chasunos, and there are specially designed headphones for babies. How much risk is presented by a chasunah may depend on which ones you are attending, and where it is located. The measured decibel levels at at least one chasunah hit 142 at the bandstand and over 110 decibels at the tables. Rabbi Yair Hoffman quotes the Ben Ish Chai, that a person should make every effort to ensure the general safety of both himself and those around him (Parashas Pinchas year cycle #2). The Turei Zahav in his commentary to Choshen Mishpat (427:10) cites a Midrash on Shir HaShirim that says that when one does this and protects himself from dangers and damage, not only is he protected, but he receives extraordinary credit for the mitzvah too. So what can be done? Baalei simchah — ask the band to keep it down. Band players — listen to the parents and others who request lower music. And young guests — safeguard your precious gift of hearing by adhering to some new standards. Note: This article presents one person’s experience with otosclerosis. His story is told for illustrative purposes only. For medical advice, please consult a physician. Otosclerosis is one of the most common causes of progressive hearing loss in younger adults. This condition occurs when part of the stapes (or “stirrup”), one of the three small bones in the middle ear, grows abnormally, preventing the bone from vibrating normally in response to sound. When this happens, sound cannot be properly transmitted to the inner ear, and the person experiences what’s called a conductive hearing loss. Otosclerosis is often inherited, although isolated cases do occur. In its early stages, the sufferer will not be affected, but if the disease is left untreated, hearing loss typically worsens progressively. In most cases, a surgical operation will restore the hearing. In the early stages, hearing aids are a great help for those who do not wish to undergo surgery. However, a hearing aid will not cure the deafness. Since the deafness is progressive, more powerful hearing aids may be needed as time goes by. 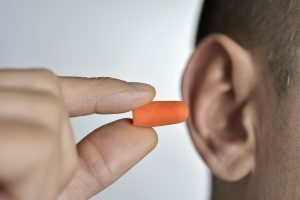 The lowly earplug, generally a cheap piece of spongy foam, is starting to gain attention as a safety device — akin to seat belts, sunscreen and bike helmets — that can protect ears from the damage caused by the loud noises of everyday life. Not just concerts and football games, where people often leave with clear signs of harm, such as muffled hearing and ringing ears. 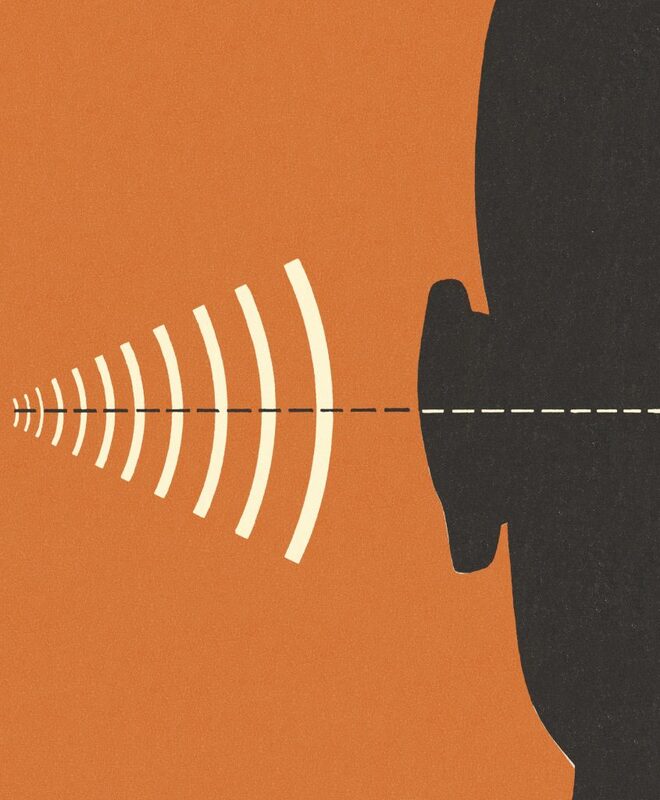 Damage from noise that doesn’t seem all that bad in the moment — such as the buzz of a lawnmower — can accumulate slowly, harming hearing in ways that may not reveal themselves for years. Enter the ounce of prevention: the earplug. They’re cheap, available, easy to tote in purse or pocket and woefully underused, hearing specialists say. For the average user, there is no best earplug. Experts encourage people to experiment with different types to find the most comfortable ones and to practice using them. There are many sources for what kinds of earplugs exist and how best to use them. As for when to use protection, experts say that when the ambient noise would drown out the voice of someone sitting next to you, you should use earplugs and save the conversation for later. Wear earplugs if you will be exposed to extended loud noise. When in very loud places, take short breaks from the noise to allow your ears to somewhat recover from the stress. This can help prevent permanent damage. After you leave, give your ears 16 hours of quiet to recover. Follow the 60/60 rule: When listening to music through headphones or earbuds, set your device at no more than 60 percent volume, and listen for no more than 60 minutes a day. Choose over-ear headphones, which are farther away from your eardrum than earbuds are. Gently towel-dry your ears after bathing or swimming to avoid infection. If you have water in your ear, pull gently on your earlobe and tilt your head to the side to get it out. Ask for a hearing test at your regular checkup so that you can catch problems early. I am writing this letter, however, to raise awareness about one aspect that perhaps isn’t given sufficient attention. It is not unique to the camp I was part of; I have no doubt that it holds true for all camps, to varying degrees. Yes, I am writing about the noise level in camp! The sound level of the mike systems and music in summer camp is unacceptable. It is unbelievable how loud the music is — with hundreds of youngsters exposed to it on a daily basis. Children are assembled in dining rooms, social halls, etc., and they are bombarded by this unacceptably loud noise during meals, and then again during breakouts, events, dancing, performances, etc. If a wedding once in a while is harmful, imagine the damage of the equivalent of a wedding several times a day! Often, the mikes and sound systems are in the hands of teenagers, who don’t realize the importance of this and who just want to belt out the loudest cheers and the most leibedige music. They hold the mikes right near their mouths and scream at the top of their lungs — and at the top of the amplifiers. It’s geshmak, it’s fun, but it’s also unsafe! It must stop! Every camp should invest in a decibel monitor (not an expensive device), and the sound system should be set up to prevent the sound from going up above a safe level. One head staff member in each camp should take this as their personal achrayus to make sure that no hearing damage is effected on children who have no choice but to be present. I feel the only sure way to do it is with a decibel monitor. It can be done. It must be done. Hashem should give us the daas and desire to treat this achrayus we carry with the seriousness and attention it deserves. P.S. Above 85 decibels is hazardous to our hearing. The music at most simchos today registers at 120-130 decibels and higher — definitely a concern for adults, teens and children. Hearing loss is progressive, painless and permanent.